My favorite constructions vehicles are feller bunchers. The wheeled ones. So I am naturally inclined to make them. I built a small one; I built a large one. I wanted to build a medium one, but I figured I should get out of the box. At least this time. The full gallery may be seen here, and instructions may be found here. 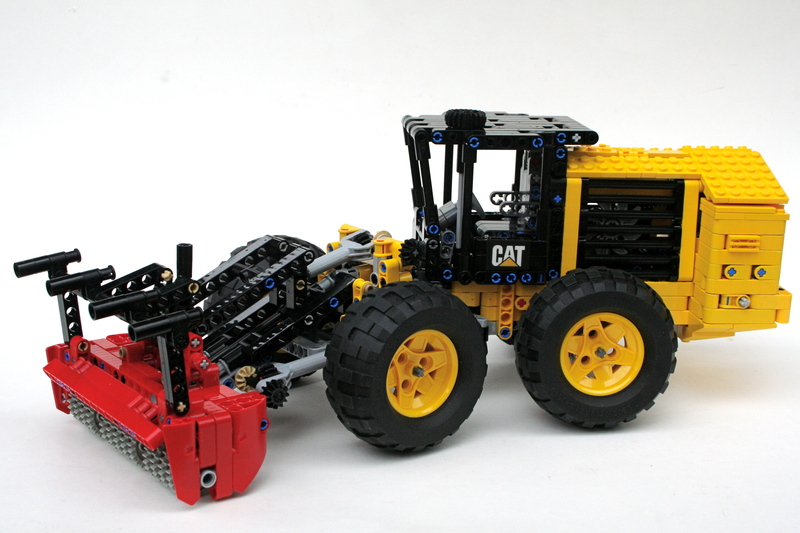 The CAT 586C is a site prep tractor. Forgive me for simplifying the work done by the engineers, but the tractor is basically a 573C with a new implement for site preparation, rather than felling. 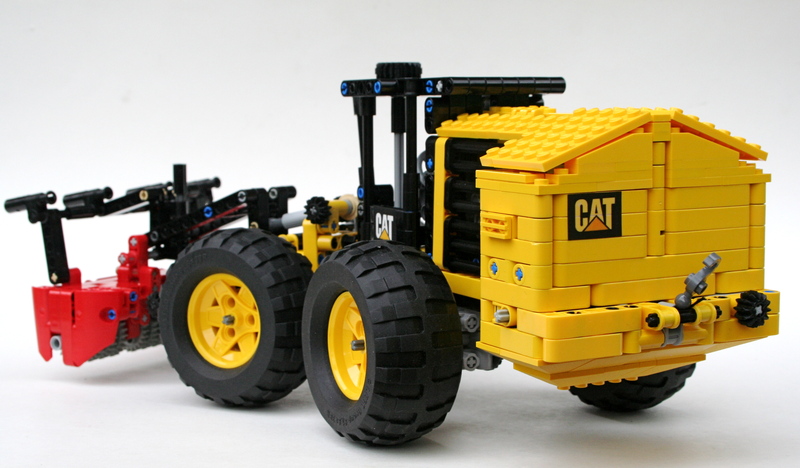 As always, I stared with scaling the full tractor from CAT’s website, and finding a size that would work well with tires, features, and aesthetics. Then I started building. 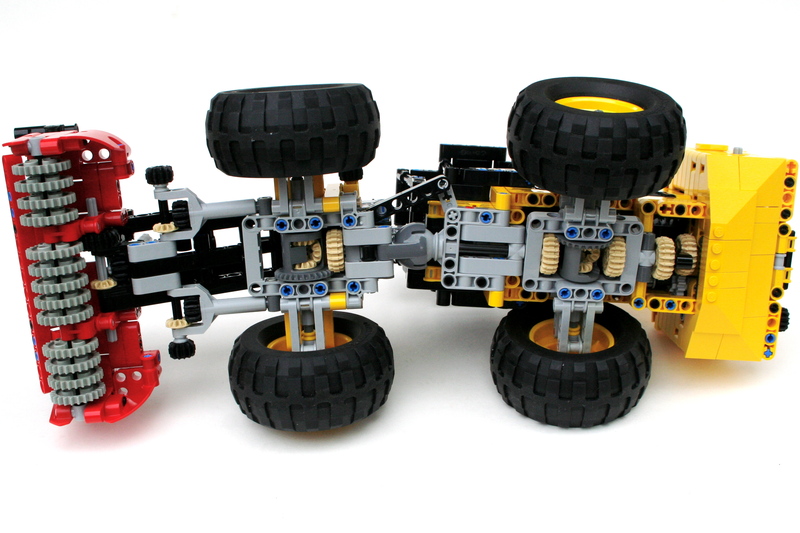 I started with the chassis, to get a sense of the size and the layout. I had a good idea of all the features I would want, and I knew some planning would be required. I then finished the mulcher (implement), which is basically a rotating drum with lots of teeth on it. I used a bunch of 24 tooth gears, and connected them to a rotating driveshaft. The chassis was built with four wheel drive, and was connected to the mulcher driveshaft through a series of gears to increase the speed of the drum. Then on to the back of the tractor. Feller bunchers and site prep tractors all have their engines in the back; pretty normal for large tractors with large front implements. But to get the weight as far back as possible, the engine is mounted transversely. This presented a couple of challenges for me. I mounted a I-3 engine on the left in the rear with simple gearbox geared up to connect it to the drivetrain. Just in front of the motor are the two cooling fans, which are also driven by the drivetrain. These are also geared up. For those of you keeping score at home, the drivetrain gears up three separate functions, so rolling the MOC on the floor causes a nice whizzing sound. 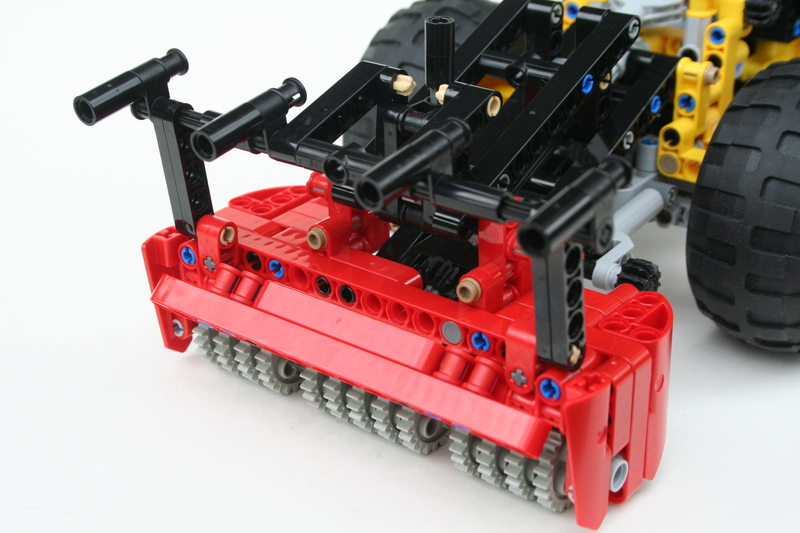 I added some additional features that mirror the real tractor. First, over the mulcher there is a guide bar that allows the tractor to push trees and shrubs down toward the mulcher. 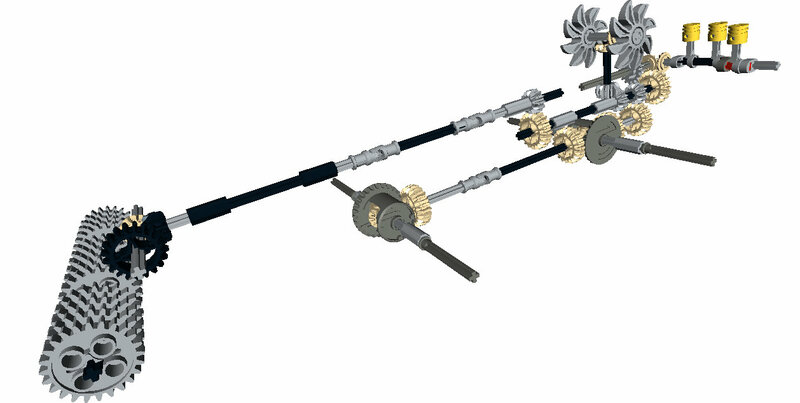 In my MOC this is accomplished by a simple worm gear mechanism. Second, I added a small winch on the rear to get the tractor out of sticky situations. Finally, a small mulching door was installed to allow for more or less entry to the mulcher, again just like the real tractor. The tractor worked well. Functions were smooth, and required no maintenance during play. The many controls on the front were a little dense, and this caused some finger congestion. The number of rotational features connected to the drivetrain made rolling on the floor a little strained. Thought, this kept the MOC from rolling off the table into a lot of pieces. Everything worked well enough, so maybe it is time to make another feller in this scale. Not today, I still have a lot of other projects to complete first. Hello, Today I have sent you a payment of US$ 5,00 (via Paypal) to receive the Building Instructions (PDF) for CAT 573C Feller. Please, send me the BI asap. Thanks for your purchase. The instructions have been sent.